Where do you think knowledge gained by reading business books belong in this 70-20-10 learning and development model? What do you think is the role and rate of the corporate library ? The original study by McCall et.al. and published in 'The Career Architect Development Planner' by Lombardo and Eichinger included 'courses and reading' in the '10'. One could debate whether this is the right place for reading to sit. If the reading is 'directed' - part of a structured program or an agreed activity - then '10' is clearly the right categorisation. However, if the reading is simply something that's done to keep up to speed on new ideas and approaches as part of self-directed on-going development, then it probably sits in the '70'. That said, reading is only a form of learning when ideas extracted are put into action. Otherwise it's just information. The role of the corporate library? Very useful as a resource, but not if only in dead tree format. Delighted to see this site and its emphasis on the 70-20-10 learning model. What is the role and place of books and reading in this 70-20-10 learning model? Do you think a corporate library plays a role in learning and performance according to this model and what do you think a corporate library of the future looks like? Hope to obtain a copy of "The Career Architect Development Planner" to further read up on the traditional place given to "books, courses, reading" in the L&D Model. I am relieved to hear that this research speaks to a more intuitive idea of the value of books and reading and I do think that reading has a place in the 70% part of the "learning" model. When books are really being read as they should go beyond being only a source of information. Reading for understanding and reading for information are two different things so your distinction between reading for "Learning" and "information" is a reminder of what great theorists of learning, from Francis Bacon to Mortimer Adler, have championed. Yes, I agree; A "book" is much more than just one of its manifestations (the "dead tree" format for books- a great phrase!) though, of course, I continue to remain a fan of old fashioned books. But I hope libraries survive and perhaps the only way for it to survive is to embrace evolving media that offer richer conceptions of what a book is. Thanks for this post! I think 70-20-10 is a great model to force L&D professionals to think differently about their profession. What struck me is the picture of Federer, because when I link the model to tennis I think 70% of learning is through formal, structured training. The experience part is limited to matches and in the end all of this learning & training when looking at the top performers is only a foundation. The talent and mentality of the player is what makes the difference. I disagree about the Tennis analogy. Training and not only a match for me is "learning by experience". Charles - thanks for sharing - we are highly supportive of the model and even make the 10% an interactive digital self-driven experience as best as we can. Career in sports is the hardest I guess. All the time you need to make yourself stronger and you need to continue that. Yet, in other professions also performance matters the most. "If you never do, you'll never know", yes this said is completely true. It's the experience only that will learn you new things. The more experience you have the more you can understand things clearly. The all way around, a coach can help you the most. Without proper guidance, it is very much difficult to make a stand. Hmm so now its renamed for high performers. Have you evidence this theory works across say engineering or medical workers? The original theory is 50 years old, and was based on self-assessment of 200 managers. So what did they learn, was it measured? Could it be the blind leading the blind? Bear in mind Google did not exist to help 50 years ago. Maria - the 70:20:10 framework isn't a 'theory'. It's a reference model or framework that helps organisations re-focus their efforts to support learning where most of it happens - as part of the workflow. The name comes from the CCL study you mention, but research well beyond that supports the principle. You will find reference to other studies in the book mentioned here https://charles-jennings.blogspot.co.uk/2015/12/start-with-70-plan-for-100.html. My colleagues and I have worked with many organisations using this approach, including with a range of medical and engineering fields. Five seconds' reflection would confirm that people working in these areas rely heavily on the '70+20' elements - learning as part of work and through others. Of course formal education is important, but that usually only assures part of the wherewithal necessary to deliver high performance. Of course people learn on the job: processes, culture, relationships. But can you implement a model that just is? It happens regardless of a training department. Any practical ideas for specific industries or tasks? 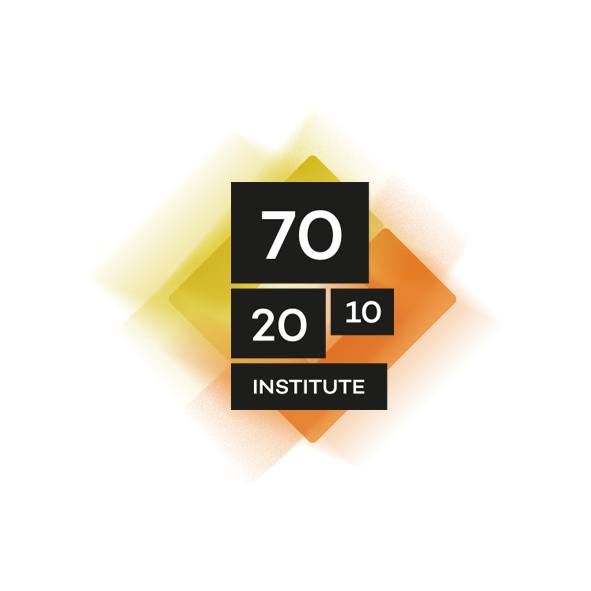 One of the main points about the 70:20:10 model is that it has, over the past 20 years, been developed as a 'framework for strategy' rather than simply a reiteration of something that 'just is'. there is considerable evidence apart from the original CCL study that resulted in 'the numbers' that shows most learning occurs as part of the workflow. One of the preconceptions that organisations using the 70:20:10 framework are addressing is that learning only occurs when it's 'managed' by the training department. If the 70-20-10 is really effective, how can it help in increasing the productivity of the employee especially in Manufacturing Industry?